Add a bit of rustic flare to your home decor with a Stonebriar galvanized metal oval bucket. 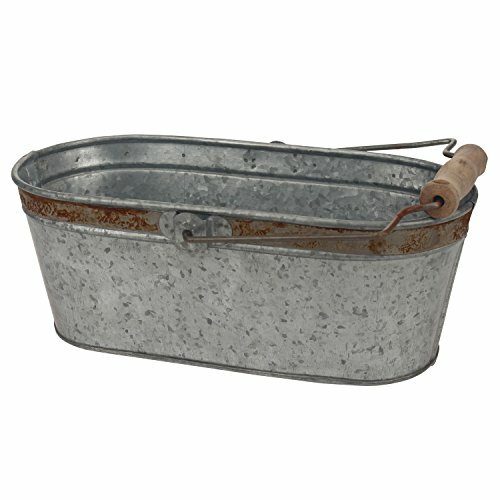 This unique bucket features a worn galvanized metal finish with weathered rust color trim for an antique feel. Bucket also comes with a sturdy wooden handle so you can easily carry it from one place to the next. Galvanized bucket measures 12.2 inches by 7.2 inches and stands 5.5 inches in height. It is the perfect size to use in your living room, kitchen, bathroom, bedroom, kids room, or patio. This unique bucket is multifunctional. Add your favorite dried or fresh flowers or decorative fill to create a rustic centerpiece for the coffee table or dining table. You can also use bucket as a planter. Need some extra storage space? You can use your bucket to organize office documents, toys in the kids room, bathroom accessories, or supplies in your kitchen and pantry. Stonebriar galvanized bucket makes a great ice bucket for parties. It can easily fit 2-3 bottle of wine or 6 bottles of beer. This decorative bucket is perfect for everyday home decor or buy multiple buckets and use them as rustic decorations for weddings, birthdays, housewarmings, or any special occasion. Buy your Stonebriar galvanized metal bucket by itself or mix and match with other farmhouse and industrial inspired home decor accent pieces from the Stonebriar Collection.